Exceptionally well cared for one owner, freshwater vessel with meticulous service history available showing the highest level of care. The Sea Ray 480 Sedan Bridge features twin, 3196 Caterpillar engines. The interior of the boat includes three private staterooms, two full heads, two entertainment centers, and sleeping accommodations for large groups of people. This is a one owner boat, delivered to current owner in spring of 2002. Freshwater boat, used on Lake Rathbun in south central Iowa from 2002 to 2006. In 2006 it was moved to the Mississippi River in Davenport Iowa where it remained until 2008. During that time the boat made a trip to Florida where it saw 4 months of salt or brackish exposure with approximately 110 hours of run time. In 2008 the boat was moved to Lake Michigan where it has remained since. Engines currently have approx 1350 hours on them and 1987 hours on the Generator. The boat was kept outside shrink wrapped from new to 2005 and kept indoor heated storage from 2006 to current. IT is currently located in heated storage in Milwaukee and can be viewed by appointment. Boat has been maintained and cleaned and waxed regularly by the owner and professional service providers. The boat has always been waxed at least once a year and has always had bi-weekly details by marine portering companies. Bottom paint done every 3-4 years as needed. Impellers replaced every 3 years. Hoses and belts have been on a regular inspection and replacement regimen. Recent replacements include Alternator belt replacement in 2016 and water intake hoses from seacocks to impellers replaced 2017. An available spreadsheet of checklists and maintenance items document hundreds of misc. repairs, replacements, upgrades, etc. An audit of original to replacement parts would confirm that to a high degree all components that have limited service life have already been replaced at least once. That would include bilge pumps and switches, fresh water pumps, battery chargers, air conditioning systems, hydraulic hoses to swim platform, etc. 2003 - Drawers were installed in the under helm access panel for storage of electronic manuals and other misc items useful for captain at helm. 2006 - The factory installation of the boot striping on the hull was placed with the bottom of the stripe exactly at waterline, making the maintenance of the hull and boot stripe difficult and costly. New boot striping was installed several inches higher and the level of the bottom paint delineation was raised to eliminate this issue. Cost was approx $2500. 2005 - Spare props purchased direct from Michigan Prop with cert papers. Cost $5000. 2007 - Full aft sunbrella/isinglass enclosure with port/stbd screen option installed. Cost $9000. 2011 - New cockpit and bridge carpet liners installed with separate hatch cover for access to bilge and mechanical. Added swim platform carpet with storage bag. Added carpet steps for safety and convenience. Added storage bag for bow cushions. Cost $3000. 2008 - Gas assist cylinders added to fish cooler box for easy access and safety. 2011 - New bridge enclosure installed with EZ2CY material. Full Optional interior white sunscreen and privacy curtain. Cost $6000. 2006 - Custom adjustable height bridge table installed with inset boat name, cup holders, and storage. Maintained ability to convert seating into berth. Cost $3000. 2007 - Installed glass windshield insert with wiper and washer in front center bridge enclosure. Cost $2500. 2007 - Removable stainless steel three bike capacity carrier for forward deck. 2011 - Red LED cockpit lighting installed to replace factory festoon bulb white lighting. Cost $1500. 2005 - Installed Racor petcock valves on bottom of primary engine fuel water separators for easy drain of water in condensate bowels. 2005 - Installed stainless steel main anchor and Danforth stern lunch anchor, 200? galvanized primary rode, and spare chain rode combo. Total of three primary rode combinations with two main anchors and one secondary. Cost $3000. 2011 - Replaced salon TV/VCR combo with track mounted LCD TV and DVD surround system. Cost $3000. 2010 - Installed Furono Hi-Def pod mounted radar/gps/chart system independent and redundant of existing Ratheon systems. Added forward and aft bilge camera monitor into this system. Reinstalled all antennas and wiring with mast mount. Cost $24,000. 2010 - Added bridge LCD TV and integrated into Furuno monitor. Cost $1000. 2010 - Replaced bridge Clarion stereo unit with new Clarion CMD5 unit for Sirius/TV/IPOD play. Replaced all Clarion factory speakers and subs with Pioneer equipment. Cost $3000. 2006 - Replaced interior carpet runners. Cost $2000. 2006 - Installed Sat Phone and antenna with salon and bridge antenna jacks for hand held sat phone. Cost $2500. 2008 - Purchased 11' Zodiac Yachtline RIB with trailer and special chocks to raise the boat on the swim platform. Cost $15000. Added depth finder and trickle battery charger with booted exterior plug. 2015 - Replaced cockpit bench seats with color inserts. The summary above is approx. $85,000 worth of improvement, enhancements, or updates. Boat records file available in hard file copy only (several hundred pages). Owner has an eight person off shore emergency raft and ditch bag with emergency equipment including EPRIB that is also available. Raft was repacked two years ago and EPIRB battery was replaced two years ago. Both are five year recommendations. List of current issues available by request, nothing more than typical minor nuances that do not affect boat integrity, safety or reliability. Boat is priced based on and consistent with market values of similarly equipped and maintained vessels. Blues Crews is a top tier vessel with exceptional care and maintenance from day one. Its well documented history, freshwater use, condition, factory options such as swim platform and sat tv, added enhancements and improvements and general appearance will allow the most stringent buyer to make this purchase with peace of mind. Current owner has offered to provide the new owner with one full day on board orientation if so requested, and will provide 30 day telephone support to answer questions. Joel Dionne Yachts is pleased to assist you in the purchase of this vessel. 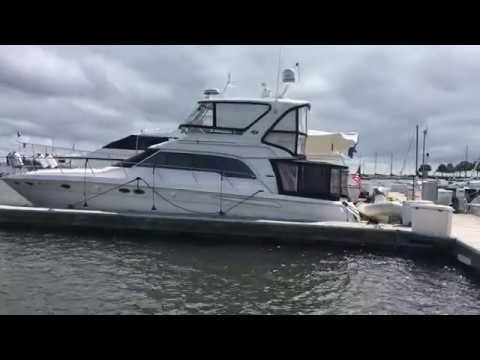 This boat is centrally listed by CenterPointe Yacht Sales.